New Zealand’s North Island has some of the country’s mildest weather and best beaches, but it’s also where you’ll find the largest city, the capital, and some exceptionally beautiful natural treasures. The island’s variety means that the best places to stay on the North Island range from remote coastal lodges to glitzy city break hotels. Auckland is New Zealand’s largest and most multicultural city, with a colourful Polynesian population and a spectacular harbour. Because of Auckland’s sprawling layout it’s useful to have access to a car, though most of the sightseeing highlights have reasonable public transport access. And the ferry offers great access to historic Devonport, as well as some great beaches, the wineries and olive groves of Waiheke Island about 45minutes away, and Rangitoto, a large volcanic island you can see to the east of the city. Wellington is the North Island’s other major city, dramatically positioned on a wind whipped peninsula and a major fault line. This is the country’s capital, so where you’ll find many of the big museums and galleries, as well as a good choice of bars, cafes and restaurants. 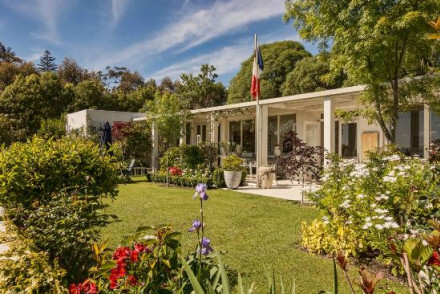 For a slower pace you could base yourself in the Hawke’s Bay region, a flat, fertile land with a warm, sunny climate which stretches from Cape Kidnappers to the Mahia Peninsula via Hastings, Napier and Wairoa. This is a great place for foodies who like dramatic ocean scenery. 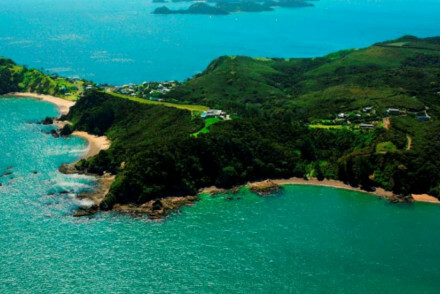 After seeing the cities, you should also see some of the North Island’s sights, like the beautiful Bay of Islands, a superb turquoise bay, dotted with around 150 islands, the vast majority of them undeveloped and uninhabited. These protected waters are extremely important historically, being both the first place the Maoris settled, and the first place the British did. And don't forget the wonderland of hot springs and geysers around Rotorua. But if you’re looking for the beaches you’ll be wanting the region of Northland, which also has one of the country’s mildest climates. There are plenty of pristine and perfectly empty beaches here, but also plenty which have been well developed to cater to families on holiday or people who’re looking for some watery thrills and spills. 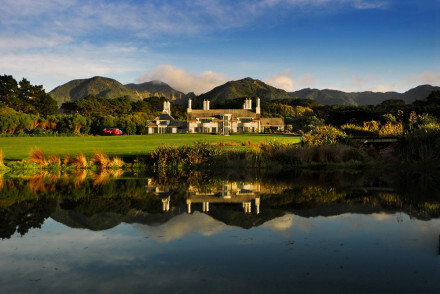 Whatever New Zealand experience you're looking for, the Hotel Guru's selection of the best places to stay in the North Island will have a property to suit - from boutique B&Bs to luxury lodges and beyond. The Hotel DeBrett has 25 colourful, retro-edged rooms, decorated with an eclectic eye for modern pieces. You’re close to Auckland’s galleries and restaurants and there’s also a gym. 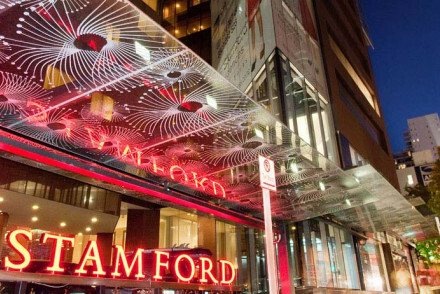 The Stamford Plaza Auckland is a smart hotel right in the centre of the city with more than 280 neat, comfortable rooms and suites, two bars, a fitness centre with a pool and jacuzzi and four restaurants. 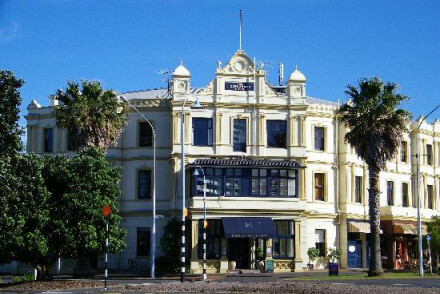 The Esplanade Hotel is a boutique hotel converted from an Edwardian building right on the Devonport waterfront. Loads of nice original features have been retained, like large open fireplaces, but there are also all the mod. cons. you need. And there are great views of the city, yet you’re not in amongst it. 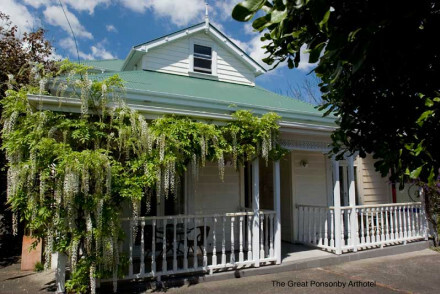 If you prefer your hotels small and boutique, then book the Great Ponsonby Art Hotel. This 11 room B&B has unique, quirky decor and plenty of local art on the walls. 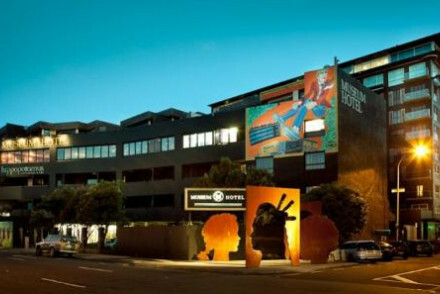 The Museum Art Hotel is a chic 160 room hotel, with contemporary art in both the public and private spaces and a boutique shop which also sells the art on the walls. Rooms are minimal but comfortable and there’s a swimming pool spa and gym. 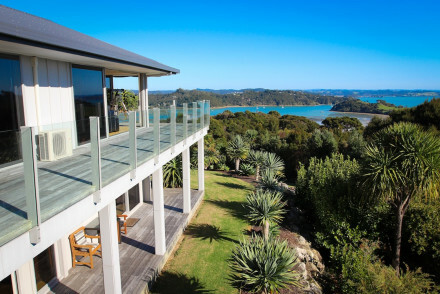 The Bay of Islands Beach House is a collection of luxurious, self-catering apartments overlooking beautiful Sullivans Bay. As well as ensuite rooms, private balconies and BBQ areas, the House also offers free use of its dinghys, sea kayaks and lifejackets. Trinity Wharf Tauranga is right on the water front, with a private pontoon and an infinity pool overlooking the bay. There are 120 rooms and self-catering apartments, which are bright and airy, with all the mod. cons.. It feels seaside-y, but is also great for the city. 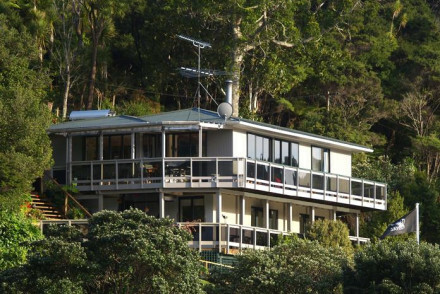 Tiki Tiki Ora is a beautiful boutique B&B just 4kms from Russell, overlooking the bay. There are just three suites, decorated with colourful and eclectic artefacts, and a gorgeous garden and outdoor dining area. 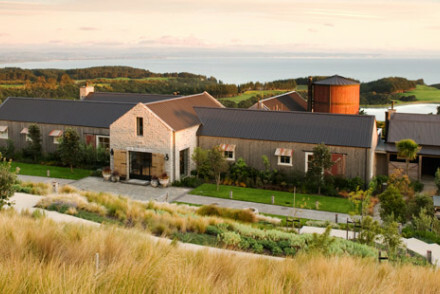 The Farm at Cape Kidnappers is a six thousand acre sheep farm with a charming, 23 room hotel. 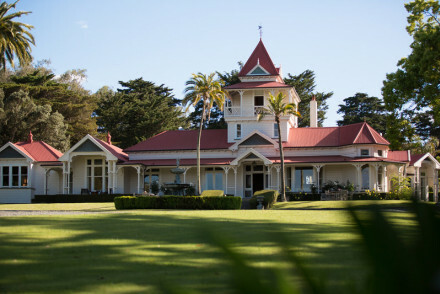 The accommodation is rustic, but elegant, with incredible views of both Hawke's Bay and the farm. There’s some amazing birdlife in this area, and the farm is lined with walking, riding and mountain biking trails. 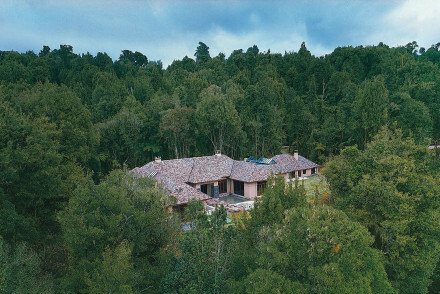 15 minutes drive from Rotorua is the lovely spot occupied by the Hamurana Lodge, overlooking the lake. The ten rooms and suites are large with natural stone and wood finishes and there’s an outdoor pool and 15 acres of landscaped gardens. 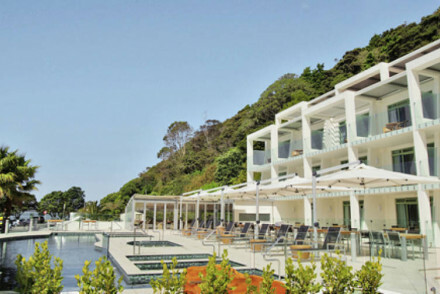 The Paihia Beach Resort and Spa Hotel is a luxurious 21 room hotel, with light and airy suites with large balconies. You’re metres from one of Paihia’s most beautiful beaches, but the hotel also has a spa and pool. And there’s a restaurant specialising in seasonal delicacies. 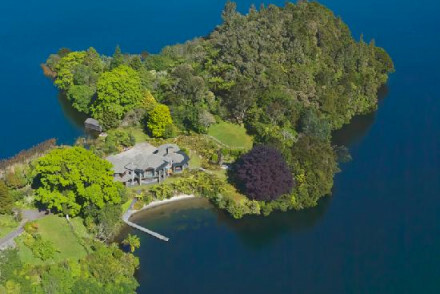 The Lake Okareka Lodge by lebua in Rotorua offers the ultimate in secluded luxury. It’s on the tip of a private peninsula and has just three huge suites. Each suite has a private veranda, modern decor and top facilities. Plus there's a pool and outdoor spa baths, a gym and a library. The Paradise View Coastal Lodge & Retreat has just two options for accommodation, the luxurious lodge itself, which sleeps up to six and the Keeper’s Cottage, which sleeps just two. There’s also full kitchen and dining facilities (including an in-house chef to make sure all your meals are special), a spa and outdoor saltwater pool. 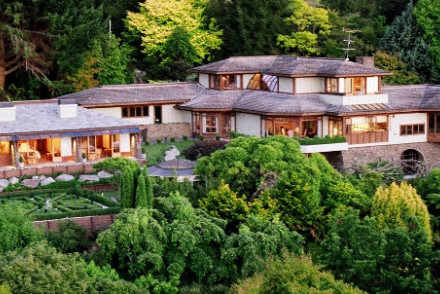 Solitaire Lodge in Rotorua is a luxurious, nine room lodge on a private peninsula on the shores of Lake Tarawera. As well as stunning views the rooms and suites are large, chic and neutral. The lodge also has thermal baths and you can swim and fish right in the lake. Flagstaff Lodge & Day Spa is a historic lodge in charming Russell, which has been converted into a four room hotel. There’s local art on the walls, a lovely garden and outdoor deck and of course the luxurious day spa. Wairepo House, a boutique, country house hotel, offers elegant suites and spectacular landscaped gardens - including working apple and pear orchards. There’s also a pool, tennis court and you’re in the heart of some spectacular scenery. 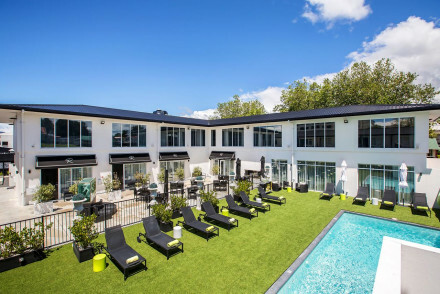 Wai Ora Lakeside Spa Resort in Rotorua is a 30 room luxury hotel and spa with bright, modern decor and comfortable rooms. There’s also a great local menu, a tranquil setting, and it’s all great value, starting from a little over £100 per night. The Russell Cottages, in the historic village of Russell, is a collection of 1,2, 3 and 4 bedroom cottages with full kitchens, laundry facilities and outdoor decking areas. There’s also a heated pool and a kid’s playground. The best airports for the North Island are Auckland and Wellington. The best time to visit the North Island is from December to March, when the temperatures generally sit in the low twenties. 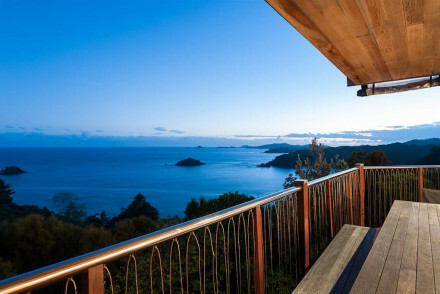 Browse through our list of all the best places to stay on the North Island. 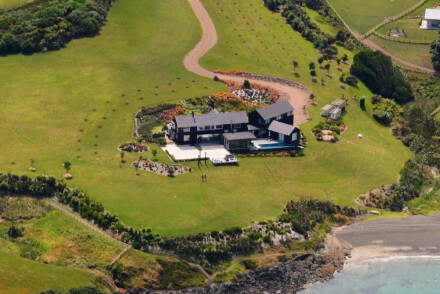 Expand your search to look at our collection of all the best places to stay in New Zealand. 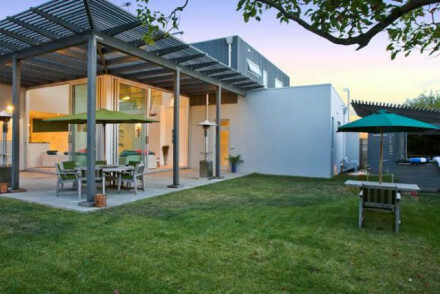 An urban retreat on the waterfront of Tauranga with a private pontoon and outdoor infinity pool. Bright contemporary rooms and self-catering apartments are available with private balconies and top amenities. A great base for exploring the city and surrounding area. 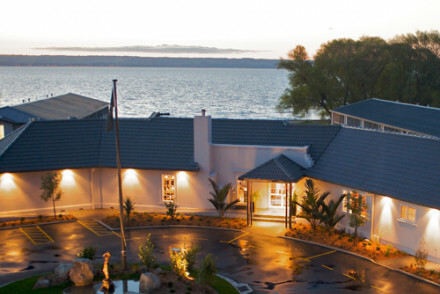 Set on the shores of Lake Rotorua, this luxury hotel and spa offers spacious and comfortable rooms with contemporary decor and bright colours. Great local menu specialising in the use of indigenous New Zealand herbs and spices. With an outdoor pool. Simple and modern rooms in eco-friendly lodge at North Cove of Kawau Island. Terrace with great forest and sea views and direct access to beach pier. Activities include birdwatching, scenic walks, beach trips and sailing trips. Home cooked food and friendly owners. Boutique hotel on Devonport waterfront. Edwardian building with original features such as open fireplaces and ensuite rooms in soft tones with great views to Auckland city centre. Perfect for a city break away from the hustle and bustle of the CBD. 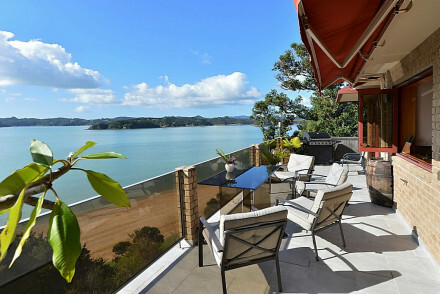 Luxury self-catering apartments with fabulous views overlooking Sullivans Bay in the Bay of Islands. With ensuite rooms, private balconies and BBQ areas. Short walk to Paihia's restaurants and shops. Use of dingy, sea kayaks and lifejackets. Family friendly. 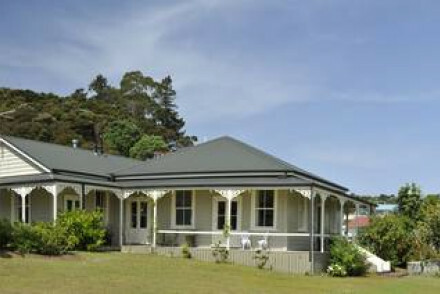 Self contained 1,2,3 and 4 bedroom cottages in historic village of Russell in Bay of Islands. With full kitchen and laundry facilities and outdoor decking areas. Kids playground, outdoor swimming pool (seasonal) and conference room. Good value, contemporary and comfortable. 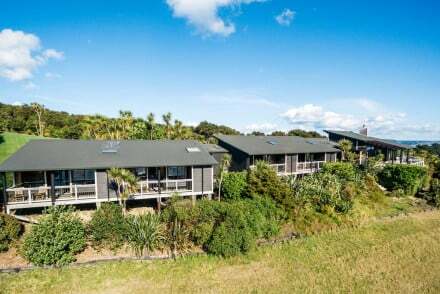 Chic apartments and studios with kitchen facilities on Waiheke Island, five minutes from Palm Beach. Spacious rooms, modern furnishings and private outdoor seating areas with sea views. With a bar, restaurant, pool, hot tub, tennis court and conference facilities. For a relaxing island getaway. Small and colourful boutique B&B run by friendly locals. Rooms with unique and quirky wooden furnishings and local art on walls. Large and fresh breakfast made from local produce. Close to trendy cafes and bars, and 15 minutes from CBD. Eco-friendly boutique B&B set in five acres with range of wild birds, cattle, sheep and trees. Two suites in self-contained building. 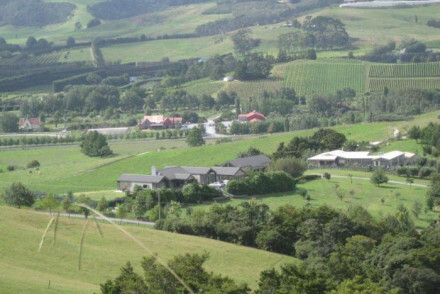 Close to wineries, walks and Matakana town. Glorious outdoor seating area with views to the Hauraki Gulf. Wonderful bright and colourful rooms with a retro edge and eclectic mix of modern furniture and local art. 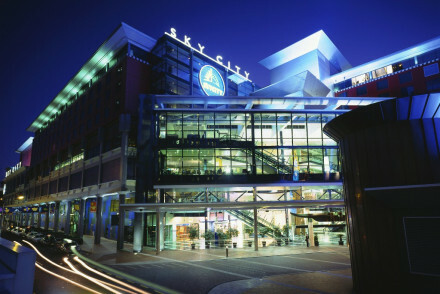 Situated in Auckland's central hub close to galleries, restaurants and great shopping. Nearby gym and massage facilities. Laid back and family friendly, with babysitting services available. 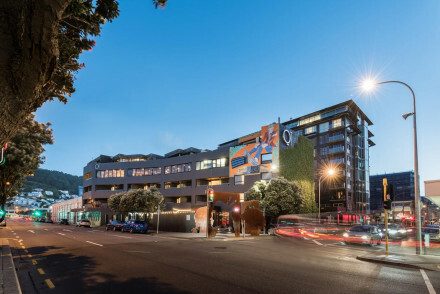 Chic hotel in Wellington, with contemporary local art in private rooms and public spaces and boutique shop selling artwork. Rooms are minimal and funky, with comfy beds and armchairs. Access to swimming pool, spa and gym. Large and classy, modern hotel with five-star service levels. Family-friendly, and with a unique dining concept. Offering a gym, rooftop pool and luxury spa as well as a classic cocktail bar and modern bistro. Complimentary shuttle to Auckland waterfront. A chic urban stay. Local exploring - Close to Auckland's boutiques, galleries and museums. The ideal base for exploring Auckland. 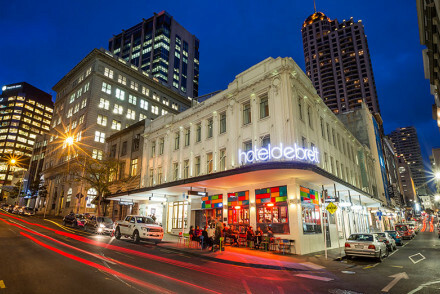 Urban chic hotel in Auckland's CBD two minutes from the SkyCity Casino. With light spacious rooms in muted tones and views across the city or harbour. Restaurant, gym and fun rooftop space with cocktail bar. Renovated heritage villa with three ensuite rooms, a kitchen, laundry, lounge and dining area. Modern, contemporary furnishings. Sun deck, spa pool, BBQ facilities and subtropical gardens. Great location for walking, watersports and fishing. Ideal for a group of six. 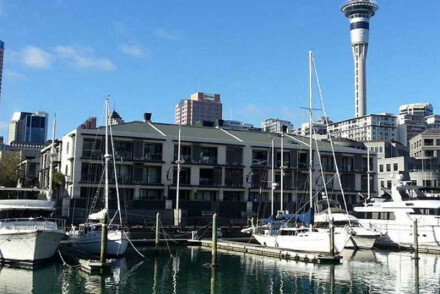 Luxury hotel on Auckland's waterfront with private marina for mooring boats. Rooms in textured natural tones including marble bathrooms, wall to ceiling windows and balconies. With an indoor heated pool, gym and spa. Perfect for a slick city stay. 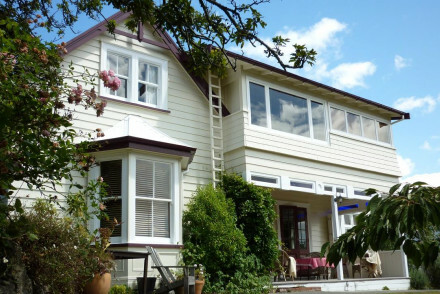 An elegant, colonial style B&B a short walk from Napier Port. Charming rooms are traditionally dressed with antiques, chintz fabrics and sink-into beds. Serving up full-English breakfasts, with a number of dining options not far away. An intimate and comfortable stay. Luxury accommodation located on a private island. Beachfront, courtyard and bush rooms to chose from. Restaurant serving free range food. Glorious sun decks and private seating areas off rooms. Range of watersport activities available. An exclusive beach stay. 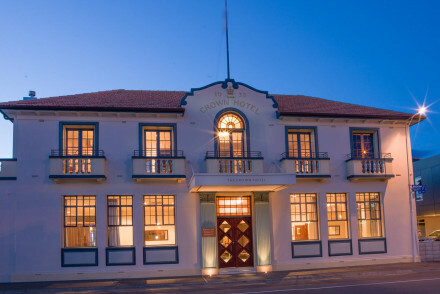 An old-meets new boutique hotel, with art deco features, set on the waterfront in the charming fishing village of Ahuriri in Napier. Retro styled suites are light and bright with floor to ceiling windows, softly patterned fabrics and large living areas. A charming base to explore the region from. 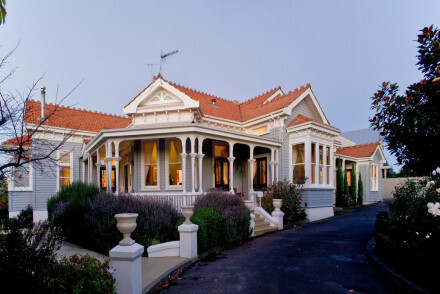 Luxury boutique hotel in 1800's spa town of Rotorua at the edge of the picturesque Rotorua Lake. Boasts a pool, gym, bar and award-winning restaurant. A chic base to enjoy a luxurious, relaxing stay or from which to explore the town or get involved in some of the outdoor activities of the region. With an emphasis on cool quirky design and curated artworks all over the walls, this riverside hotel is the latest in hip luxury. Has gourmet dining with stunning river views and a choice of trendy bars. It is just 8 minutes' walk from the beach and is opposite Te Papa (the Museum of New Zealand). 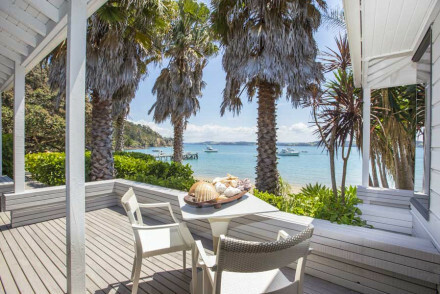 Bright, modern and comfortable boutique B&B on Waiheke Island with panoramic stunning views of the Hauraki Gulf and its islands. Rooms have air conditioning and private terraces, plus an outdoor spa pool. Close to wineries, walks and marine life. You may even see dolphin or orca from your suite. 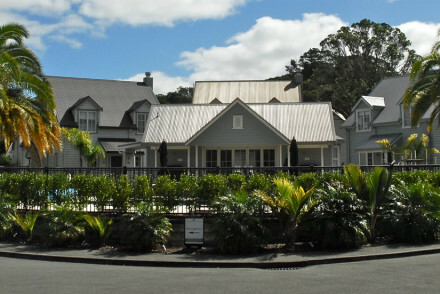 Boutique B&B 4km from Russell overlooking Bay of Islands. Three suites with colourful and eclectic artefacts, a landscaped garden and gorgeous outdoor dining area. Friendly and accommodating hosts. Great beaches and walking routes nearby. 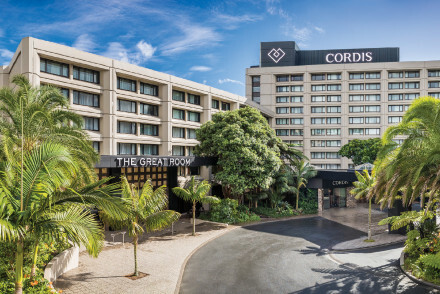 Five star luxury hotel in Auckland's CBD with decor inspired by the hills and colours of Auckland. Spacious and airy rooms with views over the harbour, as well as a fitness centre, spa and three restaurants. Babysitting services available. Perfect for a weekend city stay. 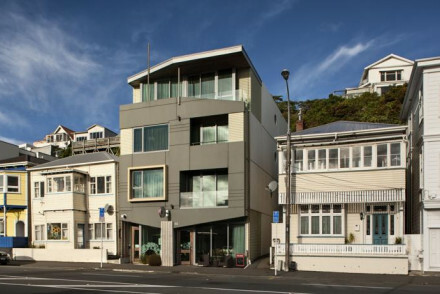 A boutique, design hotel on Wellington's seafront promenade. Strong Fifties and Sixties influence - rooms are scattered with chic furniture and have a sophisticated feel. With only ten bedrooms, the place feels intimate and welcoming. Popular communal dining evenings and good local knowledge. City Style - Traditional craftsmanship meets sleek modern design in this sophisticated Wellington boutique in the exclusive Oriental Bay. Local exploring - Ideal location, overlooking Chaffers Marina, within walking distance of the main cultural attractions, bars and restaurants. Great walks - Head down to the nearby beach for an evening stroll. 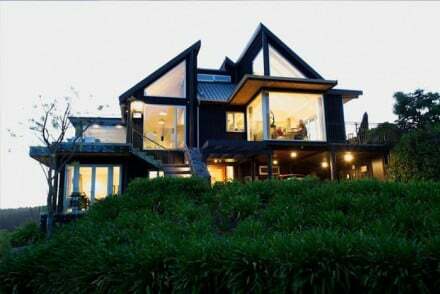 Boutique and intimate lodge with stunning location on Acacia cliffs ensuring great views over sparkling Lake Taupo. Four neutral-toned modern suites, with floor to ceiling glass windows, tiled bathrooms and private terraces. Two hectare garden with varied birdlife. Close to Mapara Native Bush Track. Large suites with striking New Zealand artwork, stylish rugs and natural stone and wood finishes. 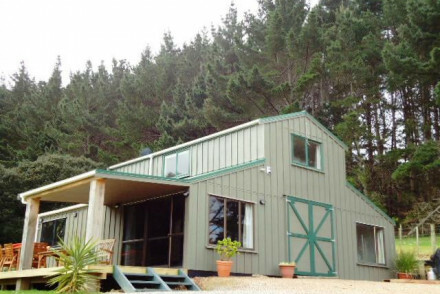 Fantastic location in hills of Rotorua with views to Lake Rotorua. Great outdoor swimming pool and 15 acres of landscaped gardens. Luxury lodge in historic century old building in the heart of Russell with four ensuite rooms. Local art on the walls, use of environmentally friendly products and large comfy beds. Gardens, outdoor deck and baths, as well as luxury day spa. 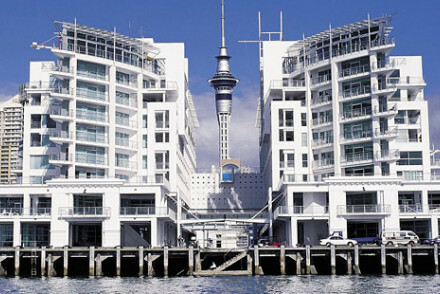 Sleek modern rooms on the Auckland waterfront with fabulous views. White walls, gorgeous full length windows and balconies. With an outdoor heated lap pool, gym and restaurant. Family friendly features include babysitting service, kids menus and family suites. 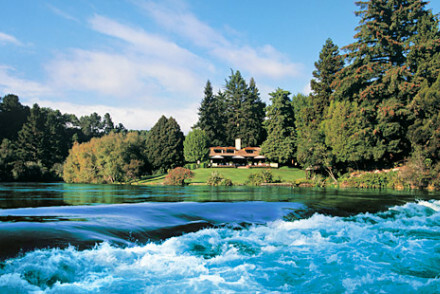 Luxury B&B lodge set in three and a half acres of wild bush on South Island's Lake Taupo. Bright, spacious and elegant suites with king size comfy beds and spa baths, private patios and great lake views. Close to Taupo volcanic hot springs, great fly fishing and Waitomo Caves. 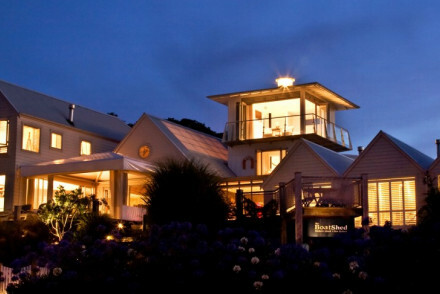 Boutique B&B on Waiheke Island off the coast of Auckland. Four clean, bright and spacious rooms with fresh flowers and wide sea views. Courtyard garden with hammocks and seating areas. Use of kayaks. Great island location. 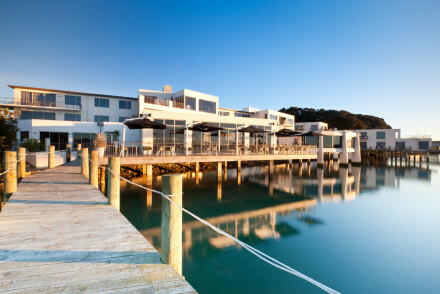 Luxury coastal boutique hotel by Oneroa beach on Waiheke Island. Rooms have whitewashed walls, nautical themed furnishings and panoramic views across the bay. Wineries and art galleries nearby. All beach gear provided. Charming lodge built with natural wood, stone and marble set in the heart of a working vineyard. Rooms have private outdoor decks, floor to ceiling windows, open log fires and comfy beds. Eco friendly and close to great walks, wineries and local markets. A relaxing country escape. 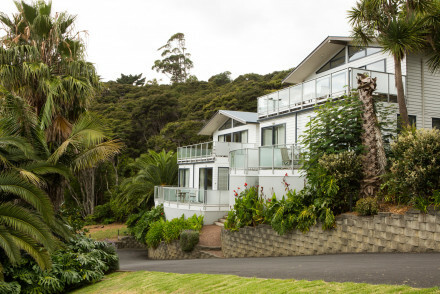 Luxury boutique lodge in easy distance of the Boardwalk Beach and Napier Port. Elegant rooms feature polished wooden floors, antiques, rich hues and indulgent bathrooms (the best of which have free-standing baths). Featuring a pool and billiards room. A relaxing base to explore the scenic region. Charming and luxurious coastal lodge with warm, contemporary, modern sea-facing rooms. Friendly hosts, self-catered or B&B option, with swimming pool, kayaks, golf clubs and bicycles available for use. Free drop off and pick up in Oneroa. Great coastal and native bush walks from property gates. 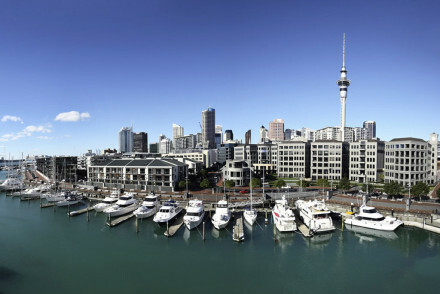 Luxury 1, 2, 3 or 4 bedroom self catering apartments in the heart of Auckland. Rooms ensuite with sleek and functional finishes. Full kitchen and laundry facilities, separate living and dining area. Suitable for short and long stays, and ideal for families and groups. A luxurious Lodge set in the heart of an eco-forest, with a range of self-catering accommodation choices. 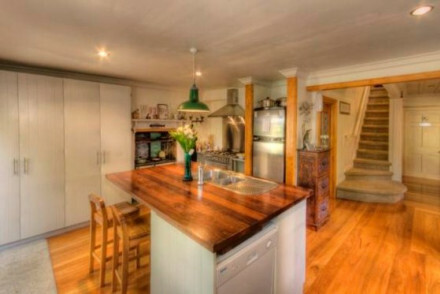 Large spacious rooms with timber and stone finishes, local art on walls and open fireplaces. Range of activities on offer including hunting, fishing and guided cultural walks. 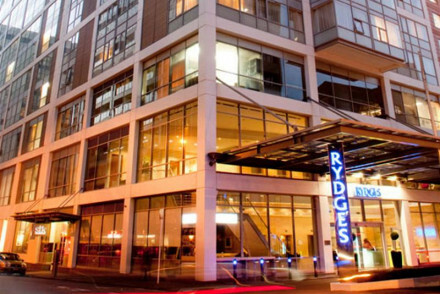 Smart hotel in the centre of Auckland offering a range of modern, neat and comfortable rooms and suites. With a fitness centre, indoor pool and jacuzzi. Four restaurants and two bars. Ideal for exploring city's attractions and eateries. 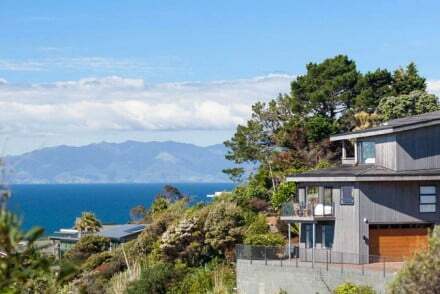 Boutique lodge with spectacular cliff top location overlooking Owhanake Bay. Modern and luxurious rooms with floor to ceiling windows, private courtyards and uninterrupted bay views. 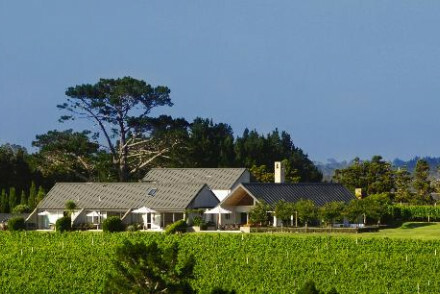 Close to wineries, olive oil tastings, scenic walks and unspoilt beaches. Ideal for a romantic getaway. 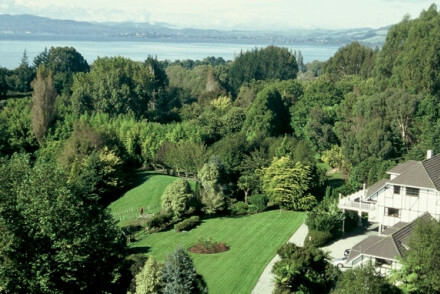 A luxurious retreat by Lake Taupo with impeccable spa facilities and delicious locally sourced or home-grown grub. Charming rooms feature pastel hues, gorgeous contemporary bathrooms and wonderful views. 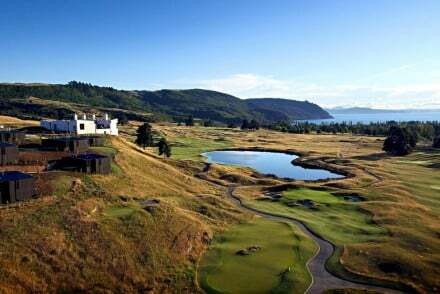 Boasting a stunning 18-hole golf course and tennis court- something for everyone! 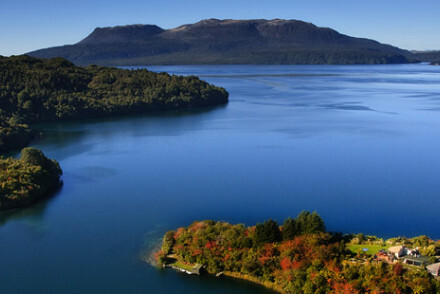 Luxurious lodge on private peninsula on the shores of Lake Tarawera with stunning views to White Island, New Zealand's only active marine volcano. Suites are large and neutral in colour, with chic furniture and spa-like baths. Activities include outdoor thermal baths, fishing and lake swimming. 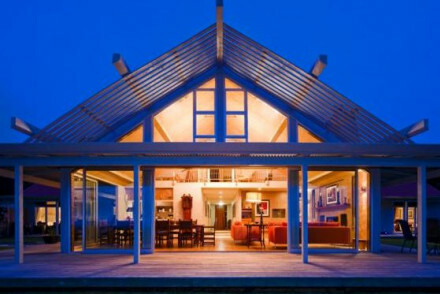 Fabulous lodge overlooking Palliser Bay. Rooms have marble bathrooms, underfloor heating and plastered walls. Indoor pool, spa, garden and gym. Off the beaten track in secluded spot, loads of activities, ideal for hideaways and romantic breaks. Charming and atmospheric 1920s fishing lodge-turned-luxury hotel with range of suites and self-catering cottages. Seventeen acre garden, open fireplaces, antique-filled rooms and private dining venues. Close to trout fishing. Perfect for the adventurous traveller seeking indulgence. 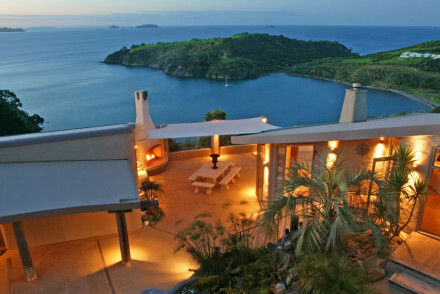 Five contemporary and opulent villas nestled on a private headland in the Bay of Islands. With private pools, saunas, gyms, kitchens, chefs, personal trainers and breathtaking views. Access to private beaches and opportunities to see rare native birds. 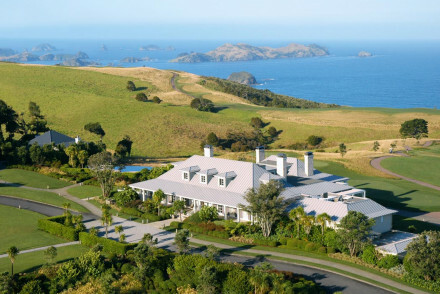 Stunning exclusivity and NZ hospitality. 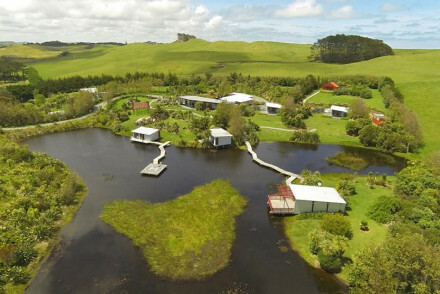 Five star ultimate luxury lodge in Rotorua on tip of secluded peninsula. Three exclusive suites with private verandas, sleek modern furniture and top amenities. With a swimming pool, outdoor spa baths, a gym and library with a baby grand piano.